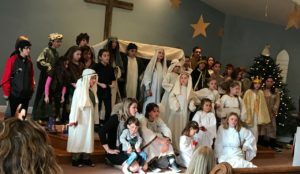 Children’s Christmas Pageant – December 8 at 10am: The Children’s Christmas Pageant is incorporated into the Sunday morning service, re-enacting the story of Jesus’ birth with narration, carols and handbells. 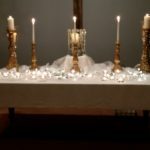 Longest Night – December 21 at 5:00pm: The Longest Night Service is held at the time of the Winter Solstice and recognizes that, in what is generally considered a joyous time of the year, many people experience sadness, melancholy and depression. It may be due to the cold and loneliness of winter, the memories of a lost loved one, the reflection on life’s challenges or the concern over a friend or family member. This service provides a safe place to express and attend to that sadness through meditation, readings, music in a quiet candle lit atmosphere at the front of the sanctuary. The service ends with the offering for anyone to come to light a candle and express out loud or in silence the dedication. Family Christmas Eve, 4:00 pm: This family-friendly service has a focus on Gospel readings about Jesus’ birth, and many traditional Christmas Carols. 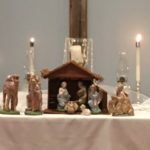 Candlelight Communion – Christmas Eve, 10:00 pm: This evening service includes readings, Christmas hymns, a sermon message, communion, and concludes with the lighting of candles. These truly are wonderful worship events that will nurture your soul. Copyright © 2019 North Madison Congregational Church. All Rights Reserved.